We define the Original Trilogy Era as the time period just before, during, and just after the years in which the original trilogy films, A New Hope, The Empire Strikes Back, and Return of the Jedi, take place. For all the adventures in the Star Wars Original Trilogy Era and the order they take place, just scroll on down! Lords of the Sith (Novel): Lords of the Sith by Paul S. Kemp is set in the time period of the Empire after Revenge of the Sith and before A New Hope. Published in April, 2015, the novel primarily takes place on the Twi’lek home world of Ryloth and features Hera Syndulla’s father, Cham Syndulla and his Free Ryloth Movement. The chance to take down Palpatine and Vader arises when the pair visit Ryloth and Lords of the Sith details not just Syndulla’s massive assassination attempt, but also the dynamic relationship between Sith master and apprentice. Tarkin (Novel): Tarkin by James Luceno does exactly what’s on the tin, it provides the background of one of Star Wars most fearful cinematic enemies, Grand Moff Tarkin. Since the relaunch of the Expanded Universe, Tarkin has gained a bit more use, appearing in Catalyst as the nemesis to Director Orson Krennic and in the same capacity in Rogue One. Published in November, 2014, Tarkin details how the military commander rose to become one of the top Imperial officers with flashbacks in between Tarkin and Darth Vader carrying out a mission assigned to them by Emperor Palpatine. A New Dawn (Novel): A New Dawn by John Jackson Miller reveals how Kanan Jarrus and Hera Syndulla from Star Wars Rebels first met and began the successful partnership which became the core of the rebel cell featured in the television show. Published in September, 2014, A New Dawn, in addition to providing more background for the two heroes, also introduced Captain Rae Sloane, who later appeared in Marvel Comics’ Kanan in a brief cameo and is a main character in Chuck Wendig’s Aftermath Trilogy. Lando: Double or Nothing (Comic): Set before Solo, this is the second miniseries to focus on one of the most stylish rogues in the Star Wars galaxy. In this adventure, Lando reluctantly takes on a job to smuggle weapons to an oppressed people ready to rebel against the Empire. At his side in the cockpit of the Millennium Falcon is L3-37, always ready with a choice word for her captain. Lost Stars (Novel): Lost Stars by Claudia Gray introduced two new characters to the Star Wars universe, Ciena Ree and Thane Kyrell. Born on the same planet in dramatically different circumstances, the story is a romance between the two which is set within the entire time frame of the Original Trilogy Era, beginning before A New Hope and finishing with the Battle of Jakku after Return of the Jedi. Published in 2015, Lost Stars offers a perspective from those in the ranks of the Galactic Empire to the pivotal events of the original trilogy. Leia: Princess of Alderaan (Novel): The third novel by Claudia Gray was published in fall, 2017, and is her second to focus on Leia Organa. Leia takes place in Princess Leia’s teen years as she learns of and joins the rebellion against the Galactic empire. Set before Star Wars Rebels, it also introduces Amilyn Holdo and the planet Crait of The Last Jedi fame. Star Wars Rebels (Television): Rebels, an animated television show about a team of rebels who live in the Ghost, began airing in 2014 on DisneyXD. Initially set four to five years before A New Hope, the show’s third season takes place approximately two years before Rogue One. The Marvel Comics title, Kanan: The Last Padawan, a twelve issue series has a few moments set in the same time as Rebels, but otherwise takes place in the Prequel Trilogy Era. Rogue One: Cassian & K-2SO (Comic Book): Before Cassian Andor and K-2SO fought side by side against the Empire, they fought each other. In this one-shot story, we learn how the unlikely duo came to be as a result of a rebel mission gone south. Rogue One (Movie): The story of how the rebellion stole the plans to the Death Star in the midst of the first major victory against the Galactic Empire, directed by Gareth Edwards and released December, 2016. Rogue One (Novelization): The novelization of Rogue One by Alexander Freed, published December, 2016. Catalyst by James Luceno serves as a prequel to Rogue One and falls under the Prequel Trilogy Era. Rogue One (Comic Book): A six part comic adaptation of the film, which includes new scenes that never made it into the final version of the film. Princess Leia (Comic Book): Marvel Comics’ Star Wars: Princess Leia is set immediately after the end of A New Hope and focuses on Leia’s immediate reaction to the loss of her home planet, Alderaan. Introducing Evaan Verlaine, a fellow native of Alderaan, the pair set off on a mission to find and protect the surviving remnant of Alderaan’s people and its culture from an empire determined to remove all trace of the rebellious planet. Written by by Mark Waid with art by Terry Dodson, the series was limited in nature and only five issues long. It’s now available as one single volume. Smuggler’s Run (Novel): Smuggler’s Run takes place only a few days after the end of A New Hope with Han Solo and Chewbacca asked to set off on an urgent mission to rescue a rebellion operative in danger of Imperial capture. Published in September, 2015, as part of the “Journey to Star Wars: The Force Awakens,” it’s written by Greg Rucka and introduced a new female Imperial, Alecia Beck. Chewbacca (Comic Book): Marvel’s Star Wars: Chewbacca explores a side adventure of our favorite Wookiee not long after A New Hope. It begins with Chewbacca crash landing on a planet and encountering a teenage girl, Zarro, who needs his help to save her father and their community from a ruthless slaver-mine owner determined to sacrifice their lives in exchange for wealth and power. Chewbacca is another five issue series now collected in one volume, written by Gerry Duggan and illustrated by Phil Noto. Heir to the Jedi (Novel): Heir to the Jedi, by Kevin Hearne was published in March, 2015, takes place only months after A New Hope and focuses on Luke Skywalker carrying out a secret mission on behalf of the Alliance. The only Star Wars novel written in the first person, Luke learns more about the Force and the Jedi while also coping with the loss of his friends and family. The Weapon of the Jedi (Novel): The Weapon of the Jedi takes place after A New Hope and features Luke Skywalker discovering a forgotten Jedi temple where he learns more on wielding the lightsaber passed on to him by Obi-Wan Kenobi. Written by Jason Fry and released in September, 2015, it featured the first chronological appearance of Sarco Plank, a character created for The Force Awakens, whom Luke fights with his lightsaber. It was part of a trilogy of books released under the title “Journey to Star Wars: The Force Awakens.” Other than the inclusion of Plank, it had little to do with that film. Star Wars (Comic Book): Prior to the 90s, Marvel Comics held the license to produce Star Wars comics until it was lost to Dark Horse Comics. With the franchise’s acquisition by Disney, owner of Marvel, that license has reverted back and once again Marvel Comics is back in the Star Wars storytelling business. 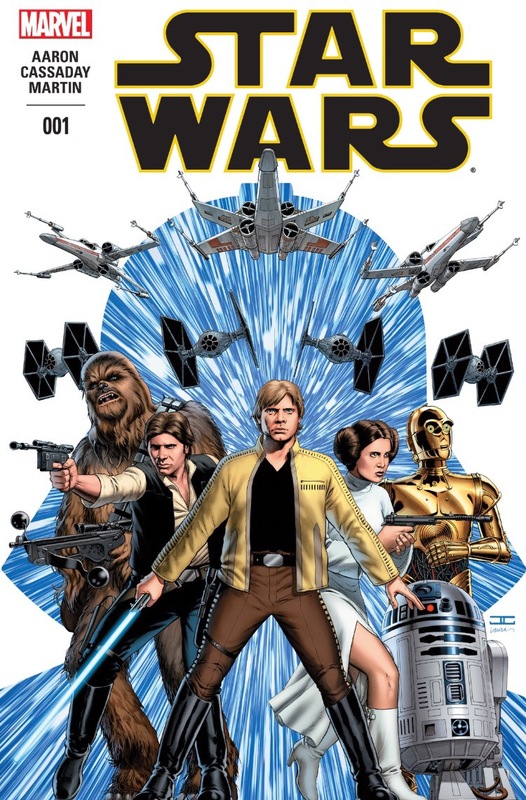 Star Wars is longest ongoing title under the Marvel banner and follows the adventures of our heroes not long after the Battle of Yavin and currently has a number of completed story arcs. 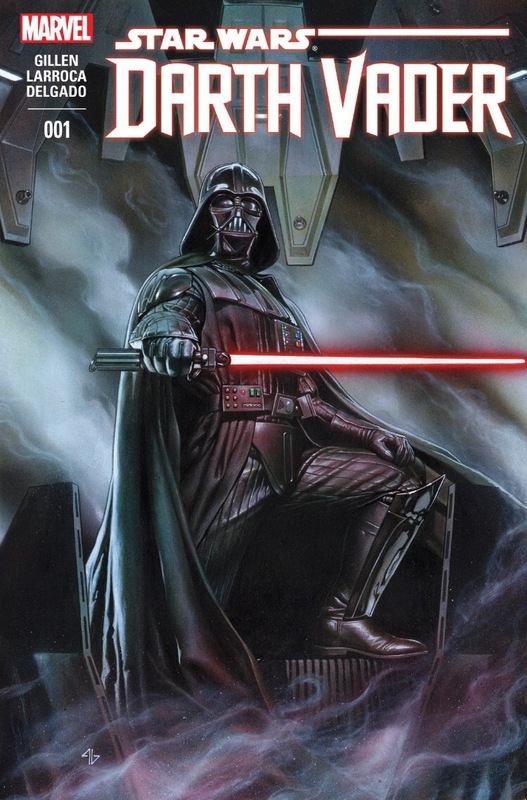 Darth Vader (Comic Book): Darth Vader is the story of Darth Vader’s resurgence from his dismal failure to stop the rebels from destroying the Emperor’s prized battle station, the Death Star, to the feared and powerful commander of Imperial forces in The Empire Strikes Back. Written by Kieron Gillen and with art by Salvador Larocca, Darth Vader introduced new characters to the Star Wars universe, such as Dr. Aphra, BT-1, and Triple Zero, and charts Vader’s path as he deals with competitors for the coveted spot at the right hand of Emperor Palpatine and secretly hunts for the identity of the rebel pilot who destroyed the Death Star. It’s compromised of twenty-five issues, plus an annual issue and a single cross-over issue for Vader Down that brought it and the Star Wars title together. Dr. Aphra (Comic Book): Spun off from the highly popular Darth Vader title, Marvel Comics introduced Dr. Aphra as the first ongoing Star Wars comic book featuring a woman character. The rogue archaeologist, determined to survive the aftermath of an alliance with Darth Vader, teams up with her two killer droids, BT-1, Triple Zero, and Black Krrsantan, a Wookiee bounty hunter, in hunt for riches while avoiding the menacing eye of the Galactic Empire. Written by Kieron Gillen with art by Kevin Walker, Dr. Aphra is an ongoing story set between A New Hope and before The Empire Strikes Back. Lando (Comic Book): A five issue miniseries set before The Empire Strikes Back, Lando is packaged as the story of a heist which serves as one part brief origin story for Lando’s friend Lobot and one part story as to how the gambler gained the motivation to become the city administrator of Cloud City. written by Charles Soule with art by Alex Maleev, Lando was one of the first miniseries released by Marvel concerning the major characters of the original trilogy. Han Solo (Comic Book): The Han Solo miniseries is special for several reasons. It’s the first miniseries written by a woman, Marjorie Liu, the art by Mark Brooks was admired enough by Star Wars creator George Lucas that he purchased the original drawings for the first issue, and it’s a darn fine Han Solo story. Recruited by Princess Leia to rescue rebel spies under the guise of competing in the toughest space race in the galaxy, the Dragon’s Void, Han Solo finds himself dodging the empire, race rivals, and his own realization that he’s become someone who believes in a cause, a rebel. Battlefront: Twilight Company (Novel): Published in November, 2015, Twilight Company by Alexander Freed takes place after A New Hope and concludes after The Empire Strikes Back. Focused on the members of the 61st Mobile Infantry of the Rebel Alliance, the novel introduces a perspective of the rebellion against the Empire from the trenches with a realistic approach to war. Moving Target (Novel): Leia plays the bait in a collaborative work by by Cecil Castellucci and Jason Fry set not long before Return of the Jedi. Armed with the knowledge of a second Death Star, the rebels need to find a safe place to gather its fleet for an attack on the deadly space station. Leia volunteers to take a small team to three planets to lure the attention of the Empire away from Sullust. A quick, short, and enjoyable read. Shattered Empire (Comic Book): After Disney opted to start the expanded universe over from scratch, Greg Rucka’s Shattered Empire with art by Marco Checchett became the first addition to reveal (again) what happened after the Battle of Endor. The four issue miniseries introduces the parents of Poe Dameron, Kes Dameron and Shara Bey, and follows the pair separately as they help Han Solo, Leia Organa, and Luke Skywalker, on three separate missions, in the first three months following the end of Return of the Jedi. The Legends of Luke Skywalker (novel): Ken Liu offers a series of tales told by passengers on their way to Canto Bight about the mythical Luke Skywalker. The storytellers live in the era just before The Last Jedi, but the majority of the tales take place in the space after Return of the Jedi. In the style of Canterbury Tales, each story provides insight into Luke’s character or how the Force is viewed elsewhere in the galaxy. Aftermath Trilogy: Aftermath, Life Debt, and Empire’s End (Novel): Chuck Wendig reveals what happened after the Battle of Endor over the span of nine months, returning Rae Sloane from A New Dawn, and introducing a new collection of heroes, such as Norra Wexley, her son Temmin, Sinjir Rath Velus, and Jas Emari, among others. The series ends with the Battle of Jakku, which littered the planet with the spaceship debris that provided the means of survival for Rey in The Force Awakens. Over the course of the three novels, one will see the birth of the New Republic, the end of the Galactic Empire, and the seeds of the First Order.